We’d love your help. Let us know what’s wrong with this preview of Chalta Hai India by Alpesh Patel. India once commanded a massive 30 per cent share of the global GDP and led the world in most fields, but today the country sadly is a developing nation. People often attribute India's sluggish progress to the malaise called the Chalta Hai ('It's okay', 'Let it be') attitude, but not everyone agrees with that presupposition. Debates on the subject are often inconclusive and India once commanded a massive 30 per cent share of the global GDP and led the world in most fields, but today the country sadly is a developing nation. People often attribute India's sluggish progress to the malaise called the Chalta Hai ('It's okay', 'Let it be') attitude, but not everyone agrees with that presupposition. Debates on the subject are often inconclusive and discomfiting questions remain unanswered. Are we really a Chalta Hai nation? Is Chalta Hai ingrained in our DNA or is it just a bad habit which can be easily exterminated? Will this attitude stop India from becoming a global power? To ask other readers questions about Chalta Hai India, please sign up. 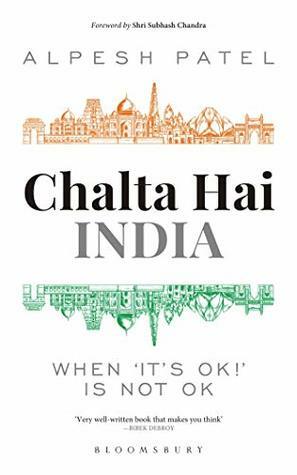 Chalta Hai India: When ‘It’s Ok!’ is Not Ok by Alpesh Patel is a wonderful book that tells about the Chalta Hai attitude ingrained in our DNA or is it just a bad habit which can be easily exterminated? The book is divided into four parts, exploring, measuring, reasoning and the solution for the chalta hai attitude. The author has briefly explained the concept of chalta hai, how Jugaad keeps us away from growing because of chalta hai attitude. It’s a book that every citizen must read to bring chan Chalta Hai India: When ‘It’s Ok!’ is Not Ok by Alpesh Patel is a wonderful book that tells about the Chalta Hai attitude ingrained in our DNA or is it just a bad habit which can be easily exterminated? The book is divided into four parts, exploring, measuring, reasoning and the solution for the chalta hai attitude. The author has briefly explained the concept of chalta hai, how Jugaad keeps us away from growing because of chalta hai attitude. It’s a book that every citizen must read to bring change in their lives, in our nation. The book has 15 chapters talking about the chalta hai attitude that we have, how it does not help in developing the nation. It tells about the chalta hai attitude that we see in our surroundings. From the cause to resolutions of chalta hai, everything is well explained by the author. The concept of the book is completely different and important. The language used by the author is simple and apt. The writing style of the author is gripping and upto the point. The author keeps the reader hooked throughout. It’s a well-researched book. I loved the way the author selected the points to measure and find solutions for chalta hai. From sports to culture, from films and movies to transport the author left no stone unturned to explain the chalta hai attitude. It has some interesting facts which we are unaware of. The author compared India with other countries showing the graph of growth. we all want India to be a developed nation but what’s stopping us to be one. There’s an answer in this book for the same. The cover and the title of the book is impressive. It’s a detailed book, a bit heavy read. Take your time to read and understand every page. I would recommend each and everyone to read this book. ⚫The book is divided into four parts so I will be discussing the review according to the parts. ⚫ Part one is all about exploring the ‘It’s okay’ life. Part one is basically introduction of the book. Basically CH that means “Chalta Hai” approach, what is it, why and what is it’s impact etc. I found that part quite generalised but it was necessary to understand the concept of the book. ⚫ Part two is measuring the “Let it Be’ Menace. I like the writing style in that part and concepts chosen. That in ⚫️The book is divided into four parts so I will be discussing the review according to the parts. ⚫️ Part one is all about exploring the ‘It’s okay’ life. Part one is basically introduction of the book. Basically CH that means “Chalta Hai” approach, what is it, why and what is it’s impact etc. I found that part quite generalised but it was necessary to understand the concept of the book. ⚫️ Part two is measuring the “Let it Be’ Menace. I like the writing style in that part and concepts chosen. That includes Road transport, sports, education etc. I like the points highlighted in table at the end of each chapter. ⚫️ Part three is Why this ‘Take it easy Policy? The big five reasons and I completely agree with the author about it. ⚫️ Part four is the root causes and resolution of CH and everyone should definitely try to implicate these points in our day to day activities and life. ⚫️To write a non fiction and on such concept, authors has to be thorough with his research and knowledge and author has really done a great job, I must say that. ⚫️ To write regarding this subject, author has to choose language very carefully so readers don’t misinterpret what author is trying to convey. And author has definitely chosen good language and vocabulary. Very well written. ⚫️ It covers all major social issues and well presented with facts, data and good real life examples. ⚫️ Overall good one and worth reading. I am very impressed by the extensive amount of research which has been put in this book! If you are stereotyping that a non fiction books are boring after a point of time, let me tell you, this book is full of very interesting facts which we are unaware of. Of course, today's generation who are looking forward to see India as a developed country and have seen India progressing will be very keep to read this book just like I was. There is no preaching in this book but answers to unasked questions. A I am very impressed by the extensive amount of research which has been put in this book! 3. Why This 'Take it Easy' Policy? The presence of Chalta Hai has been noted right from assault cases to rail accidents which left me shook. Alpesh has also mentioned about how this menace is not just centric to India or Indians but is present in every country, be it developed or a developing nation. Although, this book concentrates solely on India and the people of India. The language is easy to understand and is free from grammatical errors. All aspects from politics to business firms have been taken into consideration. It is funny how I started to recognise the Chatla Hai attitude which I carried and which was always being spoken of around me but never really was aware it. It made me conscious of my thoughts and my surroundings motivating me to not let Chalta Hai be in my way of better version which can be possible otherwise. I read this book while i was staying in Goa, indulging in all the beaches and (cheap) booze it had to offer. That alone may indicate what a page turner this book ended up being such that i finished it in record time , in a midly inebriated state. Chalta Ha is all about attitude- that attitude that makes us walk past a starving beggar on the street without so much as a glance towards him, that attitude that encourages us to accept the bad infrastructure, the frustatingly bureaucratic systems, the I read this book while i was staying in Goa, indulging in all the beaches and (cheap) booze it had to offer. That alone may indicate what a page turner this book ended up being such that i finished it in record time , in a midly inebriated state. Alpesh Patel explains, that historically, our country has always been an inward looking nation.We've never invaded another country or been involved much in International affairs, even the very essence of Hindiusim is to find peace and one's true self from within, and not look at others for answers. While this attitude has its merits, it has also made us non-competitive, in the sense that until recently(Globalism) we never really looked at other countries for setting a certain standard of Quality in different areas. We only looked inwards, at our country and without any kind of comparision to have, we were satisfied by our way of life and our standards. It's only when indians travel and are exposed to first world countries and can actively compare their lifestlyes ,systems and standards with our own that the reality comes in shockingly...and this is why an outward , competitive approach is neccessary to tackle the problem of CH. While the book dosen't give clear solutions on how to tackle CH( mostly being vague things like increasing education, developing more open markets etc etc) it does by the end, acquaint the reader with a very comprehensive view of what CH is, why and how it is prevalent in india and what are the major areas on which it has its impact. This alone merits this book a full 5/5, not just for being an interesting read but also a very enlightening one. Sometimes we all have thoughts as we ponder - about the fact that though India is full of talented people, likes of while world has hardly ever witnessed before. And why is that it's still lagging behind, despite the stipulated talents in this country? It's basically because of generalised thinking that 'sab chalta hai/sab tikh hai (it's OK), 'Everything is fine', the lackadaisical attitude towards country with mindset 'it's not my problem or responsibility, so why should I be bothered about it! Sometimes we all have thoughts as we ponder - about the fact that though India is full of talented people, likes of while world has hardly ever witnessed before. And why is that it's still lagging behind, despite the stipulated talents in this country? It's basically because of generalised thinking that 'sab chalta hai/sab tikh hai (it's OK), 'Everything is fine', the lackadaisical attitude towards country with mindset 'it's not my problem or responsibility, so why should I be bothered about it! Though it's a sad fact, but this is the harsh reality that majority of people in our country, have this kind of selfish compassion towards our country. The sole reason why it's lagging behind. In a preemptive approach, the author has tried to point these issues, delve upon & discuss them. Also talking about why these things happen, how to rectify them - improve ourselves & contributing in a better way to make society - country developed. The amount of research incorporated in this book is worth commendable. It's not the average nonfiction book which readers often judge at first glance. It teaches us many things & it becomes interesting bcoz the readers get to learn something new out of it. The facts, figures, representations extrapolated here are quite interesting & seemingly plausible to understand. 4. The Root Cause and Resolution of Chalta Hai. Book Name - "Chalta Hai India"
First of all I would like to thanks@author_alpesh for giving the book to review. ♎How often we have used the word "Chalta hai", "Theek hai", Jugaad" in our life. Even if we are not satisfied with something, we tend to say "Sab Chalta hai yaar". ♎ Is 'chalta hai' ingrained in our DNA or is it just a bad habit which can be easily exterminated? ❤️ Alpesh Patel brings out the book that charts out suggestions on how to get rid of the 'chalta hai' attitude and take India closet to becoming a developed nation. 📖 A well researched book that is imperative for India. 1) Part 1- Exploring the 'It's okay' life. 2) Part 2- Measuring the 'Let it be' Menace. 3) Part 3- Why this 'Take it easy' Policy? 4) Part 4- The Root Causes and Revolution of Chalta Hai. ❤️Personally hats off to the author that he devoted 5 years of his life to write this knowledgeable book. On spending time in R&D. Various Case studies and facts have been mentioned in the book. ♎The Book revisits our cultural, ideological and political history over three millennia to trace the roots of chalta hai attitude of Indians. 🔰Interesting facts have been mentioned which provokes the reader to know the truth about chalta hai. ♎The author wants to spread the message that # Say No to Chalta Hai. 🔰The book has covered almost every topic such as Road Transport, Films & Music, Sports, Education etc. ❤️Some of the facts mentioned are really mind blowing. 🍒Just a simple message which I want to recommend is that "Life live in a way which u want, never gets satisfied with less". ❤️"Say no to chalta hai, say"sab badal Sakta hai". A Highly Recommended book to everyone. This book raises a valid question, which was being avoided till now, against our Chalta Hai! and Mujhe Kya? attitude & behaviour. The foreword by Dr Subhash Chandra, a Rajyasabha MP and owner of Zee Group, explains the content of the book exactly. It is true that thousands of people die because of our Mujhe Kya? attitude & we have failed to eradicate corruption because of our Chalta Hai! attitude. The author has explained in his Preface that he had been noticing this attitude of not only This book raises a valid question, which was being avoided till now, against our Chalta Hai! and Mujhe Kya? attitude & behaviour. The foreword by Dr Subhash Chandra, a Rajyasabha MP and owner of Zee Group, explains the content of the book exactly. It is true that thousands of people die because of our Mujhe Kya? attitude & we have failed to eradicate corruption because of our Chalta Hai! attitude. The author has explained in his Preface that he had been noticing this attitude of not only Indians but people from other countries also for a very long time, as we did also but ignored. After some time he decided that the time was ripe for writing a book on this very big issue, but we don’t give it much importance that’s why it turned in to a big issue. He worked very hard for years and brought us this masterpiece which explains the Chalta Hai! attitude in an exact and interesting way. The author has used a lot of true examples which makes the book more interesting. He has done the historical and political analysis of the topic in his this book also. He explains the question that was we Indians always like this or did we develop this attitude in the last few decades/centuries. And also that is it true that only our politicians are responsible for this attitude of ours or are we also equally responsible for this issue. This book is soo well written with all the facts that the author has tried to gather and put it in words. The amount of hard work and research that is behind this book coming out and we getting a chance to read is commendable. We should appreciate that atleast someone is trying to give us a close up of the on going scenario of our Indian attitude. The chapters are based on various different topics. 1. Exploring the It's okay life. 2. Measuring the "Let it be" menac This book is soo well written with all the facts that the author has tried to gather and put it in words. The amount of hard work and research that is behind this book coming out and we getting a chance to read is commendable. We should appreciate that atleast someone is trying to give us a close up of the on going scenario of our Indian attitude. The chapters are based on various different topics. 2. Measuring the "Let it be" menace. 3. Why this "Take it easy" policy. 4. The root causes and revolution of chalta hai. It is not just that it has facts about India you will come across facts from many other countries as well which will force you to think about our own Indian attitude. There is comparison between India and other countries from the past and present. This helps us to look at the graph of our achievements with the other countries. The language used will make you feel comfortable to read but just to bring to your notice it is a heavy read. So don't go through this book at fast pace. Take your time to grasp each and everything that the author is wanting the now a days Indians to understand. Is it OK to keep going ahead with our chalta hai attitude? Please please read this book to check our chalta hai attitude is useful or useless for India to grow. Cover is designed accordingly to the book's content and it just looks perfect. Coming to the content, it is well researched, detailed and written in a descriptive yet interesting manner. The book is an eye opener in various aspects, will surely help in changing our attitude towards the various difficulties we face, and the fortunate we reap. In an attempt to target the general ‘Everything is okay, sab chalta hai, let it be’ kind of attitude plaguing the country today, Patel questions our conscience and tries to shake us awake. An unusual but a much needed read, it calls for our concern, yours and mine. What I loved the most about this book is that it gives us a balanced view of the term Chalta Hai. It has multiple examples like the rise of Gulabi Gang, risk taking like Tata motors, quality awakening like Germany, which I found very inspiring. The author deftly convinces us how we, Indians, have had "low external awareness and very little outward aspirations," with respect to the development. We are caught up in the web of our culture because in India development is hampered because the governm What I loved the most about this book is that it gives us a balanced view of the term Chalta Hai. It has multiple examples like the rise of Gulabi Gang, risk taking like Tata motors, quality awakening like Germany, which I found very inspiring. The author deftly convinces us how we, Indians, have had "low external awareness and very little outward aspirations," with respect to the development. We are caught up in the web of our culture because in India development is hampered because the government doesn't want to hurt the religious sentiments. We Indians resist change if it goes against our beliefs. For instance, the construction of wide roads is impossible if the temple in between isn't razed!